Tune in during The Home Stretch and The Wire Service this Friday afternoon/evening for your chance to win tickets to FELA! UA Presents hosts critically acclaimed Tony-winning musical FELA!, with performances this Friday and Saturday (performances at 2 and 8pm). FELA! tells the true story of legendary Nigerian musician Fela Kuti, whose soulful Afro-beat rhythms challenged a corrupt government. FELA! is a triumphant tale of courage, passion and love, featuring Kuti’s captivating music and stunning choreography. 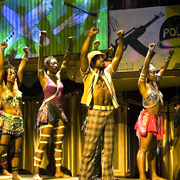 FELA!, Friday and Saturday at Centennial Hall. Limited 50% off special running right now for a pair or more of “c” and “d” seating with the promo code “HOTTER”. Tickets and information at 621-3341 and UAPresents.